There are three common tests that are used to identify and treat an infection. The first is a gram stain, where a sample is looked at under a microscope after having a stain applied. A culture also helps determines what organism is causing an infection by allowing the bacteria to grow to be better examined and a sensitivity determines how the organism can best be treated. The process begins by obtaining a sample. Many types of samples can be tested including exudate or pus from a wound, sputum, blood, stool, or a urine sample. The same sample can be used for the gram stain, culture, and sensitivity. A gram stain is a "quick look" at a sample that is suspected to be infectious. Many types of samples can be examined in this way. The material is stained, meaning a special agent is applied to make the sample easier to see under a microscope. The sample is then examined to determine the shape and color of the bacteria causing the infection. The sample may not show enough bacteria to determine what is causing the infection or may indicate that infection is unlikely. To better determine what is present in the sample, and in order to obtain a larger specimen of the bacteria that may be present, a culture is performed. To perform a culture, a sample is placed on a plate which contains a growing medium. If you have ever taken a biology class where you grew bacteria in a petri dish, this process is very similar but is done in a sterile fashion to prevent unwanted contamination of the sample. The growing medium feeds any bacteria that may be present and allows it to grow. The plate is placed in a warm, temperature controlled area. The warmth and the moisture in the growing medium encourage rapid growth of bacteria so that the sample is large enough to be examined under a microscope. 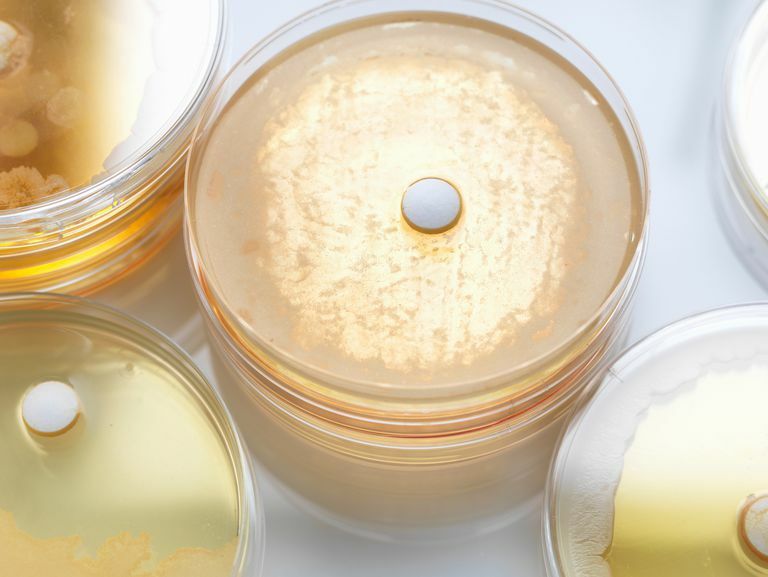 The bacteria is typically allowed to grow for at least 5 days, but a preliminary result is also possible if enough bacteria have grown to be examined. The bacteria, if present, should be large enough to identify at this point. Blood cultures are very common, but urine, sputum, and other bodily fluids can be tested in the same way. The purpose is the same: determining if bacteria is present, what kind of bacteria is present, and the best way to treat the infection. Once the culture is complete and a large enough colony of bacteria has been obtained, the sensitivity can be performed. Tiny samples of approximately ten different antibiotics are placed on the growth plate. The plate is then examined to determine which antibiotics most effectively treat the bacteria present. For example, the antibiotics penicillin, ciprofloxacin, and tetracycline may be placed on the plate. In this case, the bacteria around the penicillin stops growing, the bacteria around ciprofloxacin grows slightly, and the bacteria around tetracycline continues to grow unchecked. The report for this sensitivity would show penicillin as "sensitive," the ciprofloxacin as "intermediate," and the tetracycline would be labeled "resistant." Patients are typically treated for infection prior to the results of a culture and sensitivity becoming available. A culture and sensitivity can take nearly a week, so in the meantime, a patient with a suspected infection will likely be receiving antibiotics, as waiting a week may be harmful. The sensitivity can help optimize treatment, making it possible to choose the best antibiotic for the patient. In our previous example, the patient's sensitivity showed penicillin was the best treatment for the bacteria and tetracycline was the worst. This information is useful as the patient may be receiving something other than penicillin as a treatment. The sensitivity results tell the healthcare provider that the patient might be best served by switching to penicillin, which provides better "coverage" for this particular bacteria, or that the current antibiotic therapy is appropriate for the patient. A culture and sensitivity should be performed before the administration of antibiotics whenever possible. The results may be skewed, or no bacteria may grow on the plate, which makes it difficult or impossible to identify the bacteria responsible for the infection. In some cases, the labs may be redrawn if the patient has a new fever or new signs of infection after starting treatment with antibiotics. Simply put, a culture and sensitivity is a way to determine the best possible antibiotic treatment for an infection. There are many types of infection-causing bacteria and they respond to different antibiotics in different ways. What treats one infection may not treat another infection, which is why this culture and sensitivity is so important. The culture and sensitivity allow the provider to determine the best antibiotic for the infection without trial and error, in a laboratory, rather than by guessing which antibiotic will work the best.